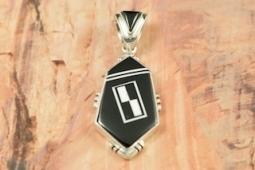 Genuine Black Jade and Magnesite inlaid in Sterling Silver. Beautiful one of a kind design. Precision inlay on the bale and pendant. Free 18" Sterling Silver Chain with Purchase of Pendant. Created by Navajo Artist Rick Tolino. Signed by the artist.